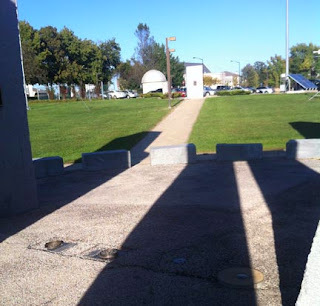 In the last post I discussed the historical background to the British Megalith Stonehenge, and briefly how it was decided to create a similar construction, albeit at half-scale, on the campus of what is now Missouri University of Science and Technology (MS&T). So we skip forward about 4,000 years from time of the last post and the new Chancellor of our campus wanders into the refreshment room at a Conference on Engineering Education in Oklahoma. There he saw one of his new faculty – and over a glass or two of the water of life (uisge beatha) mentioned that he had interest in a Stonehenge, while I mentioned that we had just developed a new method for cutting granite, and I had some idea of where to get the rock. Before I knew where we were, I was on a committee, and we were planning a monument. The campus was already in process of building a new Mining Building, itself near the Computer Science building, and there was a nearby space beside the campus Observatory. And this became the site for the new megalith. (It consists of 55 stones). 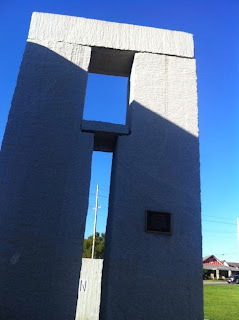 As with the early constructions, this was planned to be a working calendar, and Dr. Senne used computer models to predict the positions of the sun, and the North Star to ensure that the monument would be an accurate model for at least four millennia. But, because it was in a different location, and because of the limited space, we had to modify the Neolithic design. So this post will describe how the megalith acts as a calendar and then the next will describe how we made it. (It had to be half-scale because even at that size a single stone filled a rail car). 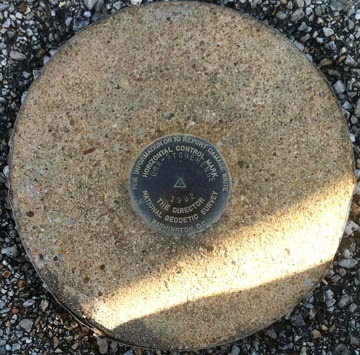 The solar alignments were built around the center of the structure, and this can be found as a small metal disk, which has been surveyed into place by the National Geodetic Survey, and mounted in a cylinder of concrete. Figure 2. 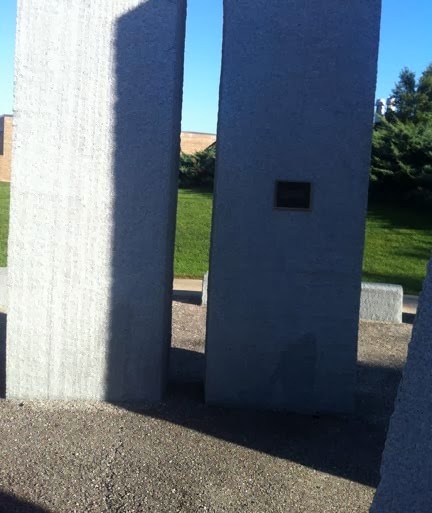 The marker at the center, with the dot in the triangle being the focus. At midsummer the sun will rise over the Heel stone. 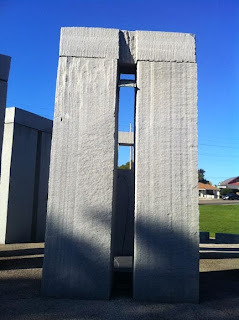 This 35-ton block of granite at the far end of the approach walkway is not exactly aligned at present, since the church behind it conceals the very first seconds of the sunrise, but it is close. A tree that initially marred the alignment to the center of the stone has since died, and the alignment is now better than it was when built. The alignment should not change over the coming millennia. (Granite erodes at around one inch every thousand years, and the Heel Stone is set in a full truckload of cement, to guard against earthquake-induced movement). Figure 3. View of the Heel Stone from the central marker (lower front right). As the sun passes through the sky that day it will move relatively around the southern half, past the East and West markers, and at sunset will lie between the two legs of the North-West trilithon. Figure 4. 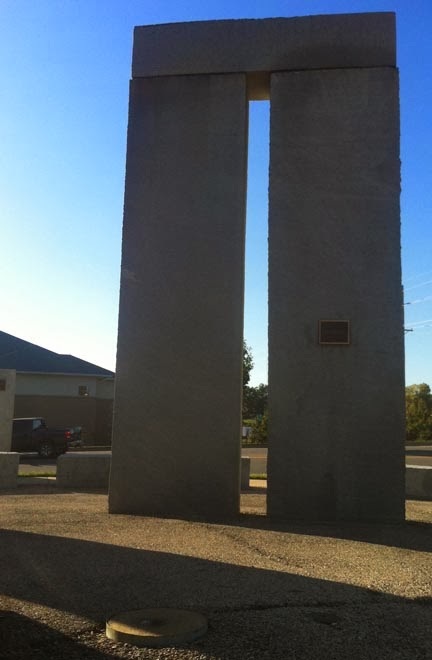 View of the North-West Trilithon, the midsummer sunset through these legs casts an orange beam that reaches to the central marker column, at its diameter. (lower front left). For the midwinter sunrise, the current McNutt Hall, housing the Departments of Mining and Metallurgy, hides the first few minutes of the rising sun, yet the sun still first appears through the legs of the South-East trilithon. As time has passed the antenna on the building that, fortuitously, marked the point where the sun was first seen has been removed. Figure 5. Looking through the South-East Trilithon to the point where the sun rises at midwinter. During the course of that day the sun moves over its relatively shorter arc, and at sunset appears to go down between the legs of the South-West trilithon. As with other alignments the construction of the University residences has slightly displaced the true alignment to the sunset on the horizon. For the next few years I suspect that the tree that is now growing into that view will further block this alignment. Figure 6. Looking through the South-West Trilithon, from the central marker, toward the midwinter sunset. This gives us two days of the year, which really aren’t enough to define the seasons, but one can add two more, based on the two equinoxes in March and September. On those days the sun rises directly in the East, and sets directly in the West. 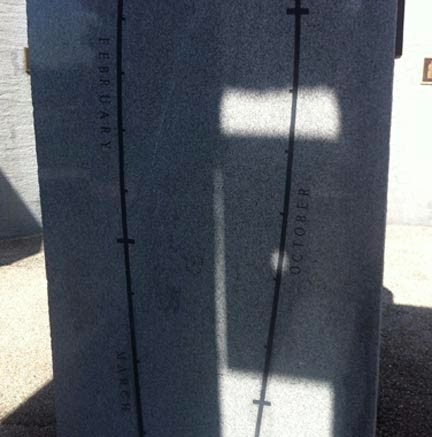 Thus, by putting small notches on the East and West marker stones, the day the sun rises and sets in those places identifies two additional days. Figure 7. The notches on the a) East and b) West marker Stones, with a notch on each to mark the sunrise and sunset at the two Equinoxes. This still, however, only gives us four days, and the Chancellor was decidedly against adding the nineteen stones to give the ancient calendar. Dr. Senne suggested, and it was agreed, that the site should be “Americanized” and that the calendar should be based on the use of the sun position, as developed by the Anasazi Indians in Colorado. 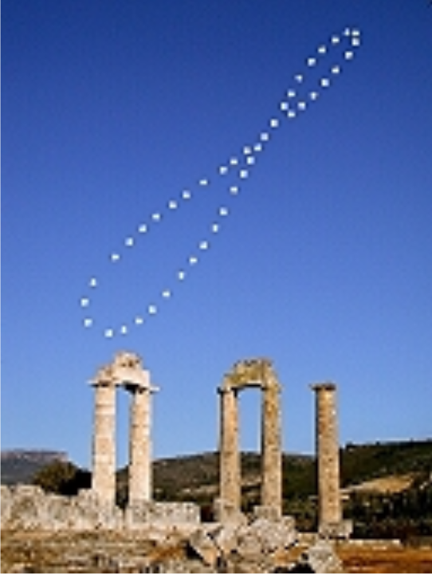 However, instead of their complex curves, he suggested a simple analemma carved into two central stones that would mirror the position of the sun at midday as projected through a small hole set within the Southern Trilithon assembly. The inverse of this curve (since it was projected through a small orifice) was therefore inscribed onto the two stones in the center. 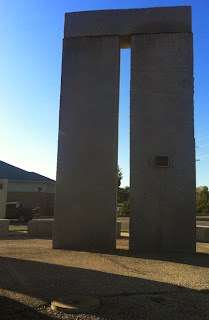 The faces carrying the inscription were the only two faces not cut with high-pressure water within the construction. Figure 9. 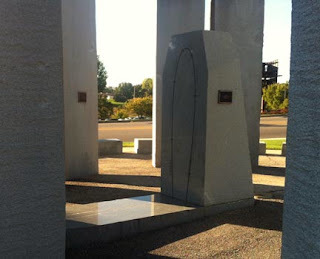 The central stones carrying the analemma markings. For the winter half of the year, when the sun is lower in the sky, the sun’s image will fall on the vertical face, during the summer half the sun is higher and the image will fall on the horizontal face. At the equinoxes the sun image travels along the joint between the two stones. The analemma was scribed into the stone with a sand-blaster after Dr. Senne had laid a full-scale tracing on the rock, to show the required positions. To make it easier to identify the actual date the line has been marked at five-day intervals within each month, which are also identified. Figure 11. The sun’s image centered on the line at midday on the ?th of ?. 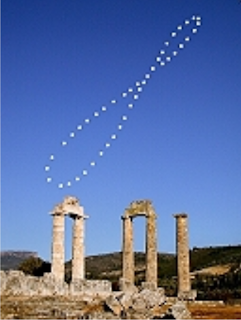 (You need to read the date from the analemma). Unfortunately this marker is likely to erode away over the next 500 years, at which point, unless it is renewed, the calendar will cease to function. In his book Mike Parker Pearson noted that the lower surfaces at Stonehenge had been shaped, but it is hard to know, after this passage of time, whether there were superficial markings on the stones, such as we have created, that would give a different way of telling the days of the year. There was one other thing that we added. 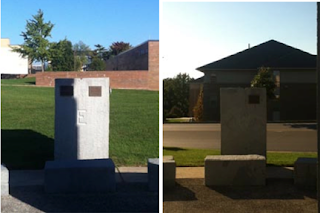 Although the North direction is shown with its own marker stone, this might get displaced, or lost. 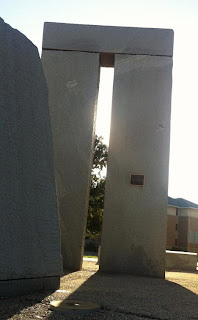 Thus a window was created in the Northern Trilithon, so that a person of normal height, standing between the light wells beside the central marker, will see (on a clear night) the Pole Star within the window, for (Dr. Senne assured us) the next 4,000 years. Figure 12. The Polaris Window on the Northern Trilithon. I will complete this series with a short post on how we cut and installed it, next time.